Rapping is not a career, hobby or interest but rather a way of life. You need to feel it in your bones, it needs to resonate in your very core and it needs to pulse through your veins. Rap is not about exaggerating features of the female anatomy or the thug life, but rather it’s about expressing yourself against the hardships in life and connecting with listeners. Then there is freestyle rap as well, which one basically makes up on the spot and is usually used in rap battles. They require one to think on their feet and usually degrade and insult the other person on stage. The first step to improving one’s rapping skills is to learn as many ‘your mama’ jokes as possible. These can be chained together for huge combos that absolutely destroy the opposition. Not only that but if you practice them extensively and become familiar with them then you can easily become a better rapper. An example can be ‘yo mama so fat that when she jumped for joy she got stuck' or any other type of jokes will do. If you wish to buy yourself some time you can drop some slang terms such as ‘yo’, ‘check it’ or if you want to move to the beat then you can throw out some random sounds while you clear your thoughts and plan your next assault. It is also wise to practice with your reflection in the mirror. This works in a number of ways as you can see both sides of the battle equation. Just remember to keep you cool and not get too offensive as it is yourself you are rapping against. When rapping against yourself, remember not to punch the reflection. It is made of glass and will end up hurting you more than the reflection. It is also a great way to learn self control for the big battle day. 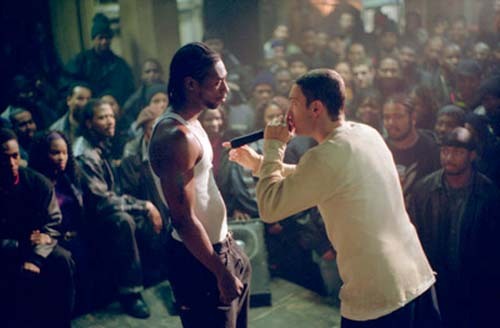 Watching ‘8 Mile’ by Eminem is another great way to find about how to improve one’s rap skills. It also helps to have real problems to talk about rather than go on about your non existent Lamborghini Gallardo and candy shops.